Another late night for Riley. 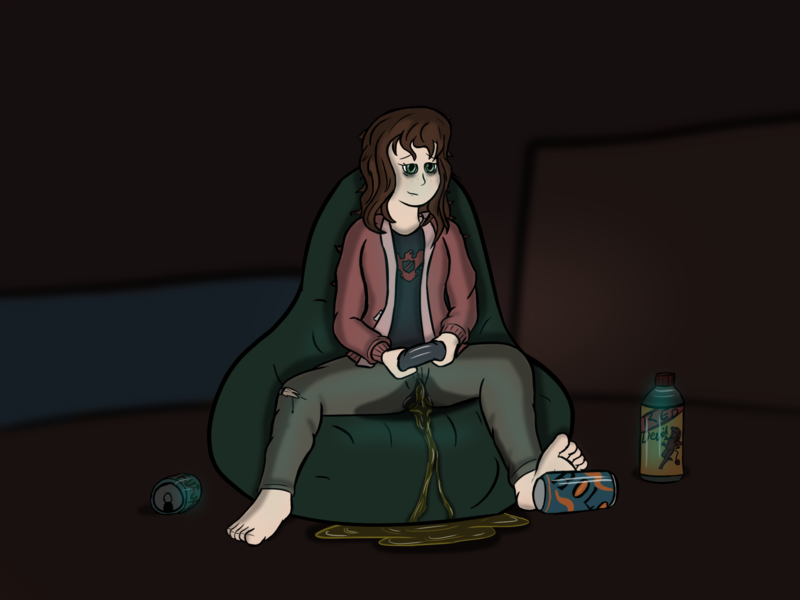 It's four in the morning, and the only things keeping Riley awake are the bottles of energy drinks she's been downing for the past few hours. Of course, these drinks have to go somewhere, and over the past two hours in particular, Riley's really been feeling them as they make their way into her bladder. She's been squirming in her seat for a good while, ignoring the growing urge to go. There's no time for that - her team's relying on her. She can't just pause the game - not in a live match. Especially a competitive game like this. She sits, wriggling in her bean-bag chair, ignoring her sore bladder. One more push and her team is through, and then they just have to secure the next point. And the one after that. An urgent wave runs over Riley. She's not going to have the strength to hold it all back until her team wins unless they can sweep their way through, and with the enemy team mounting a counter, she very much doubts this. Riley picks up a bottle from nearby and takes another quick drink as she waits for her character to respond. She can really feel each mouthful hit her bladder. She squeezes her legs together, tighter and tighter, in a vain effort to hold back. Her full bladder is getting harder and harder to ignore. It's beginning to take her attention away from the game. She's bouncing one leg up and down. She knows she can't last the whole game. So...I suppose that means there's no point in even trying, right? I mean...if she's not going to make it anyway...why bother trying? Riley leans back in her bean bag and relaxes with a sigh. Her bladder doesn't quite believe her at first, hesitating for a second, before a weak spurt of warm pee splashes between her thighs. The sudden relief makes Riley grin. A weak stream begins to trickle out and down her backside, settling in her track pants between her cheeks. This weak stream picks up strength quickly though, and before long there's a muffled hiss from below as Riley sits deliberately wetting herself. It soaks through her pants quickly, flooding warmth down her backside as pee pools beneath her. She leans forward slightly making her pants squish, and pee begins to pour down the front of her chair and onto the carpet below. The pool she's sat in is pushed forward, and it flows down the backs of her calves in a warm wave landing at her feet. The carpet goes soft and warm beneath her heels. Riley smirks as the relief floods over her, leaning back again and letting the hot puddle beneath her swill up against her lower back, soaking into her shirt. The soft hiss and trickle of liquid splattering onto the carpet fills the room as fresh urine fills the fabric of her seat. Riley doesn't even put effort into it as she relieves herself where she sits. Simply relaxing is enough for it all to pour out, too lazy to even put in the effort to wet herself properly. The hissing dies down after a while, and the stream draws to a close. Heat stops flowing down Riley's backside, the dripping slows to a halt. And Riley's finished wetting herself. Her pants begin to cool around her calves, and the warm feeling of relief fades with it. But Riley's team wins the game. So it was worth it, right? Riley presses her legs together, making a loud squish. It presses some droplets out of the fabric. She lets her hands fall into her warm lap. She's soaked these pants. Her shirt and her hoodie are damp by her back. And the bean bag is soaked through. Well, not like this is the first time anyway. And it won't be the last. Riley sits back and looks at the screen. Her pants are getting cooler now, and the puddle by her feet is getting cold. She should get changed.